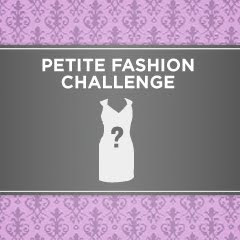 This post is in response to “Petite Fashion Challenge #1” hosted by lovely ExtraPetite. I am very excited to join other petite ladies in this challenge but nervous at the same time. Most of us know what a petite women should avoid when it comes to fashion. There are many fashion issues that are specific to petite women. But by following a few simple tips, petite women can enjoy a variety styles that aren't necessarily designed with petite figures in mind. Click here to continue..
What is rule number one for petite fashion don't? Avoid baggy/unstructured clothes. Petites should avoid oversized clothes and look for well-fitted and proportional clothes. Ideally, your tops should just hit your hips but never fall below it or else your legs will look even shorter. This shirt has so much extra fabric on me and it would not work tucked in. Today my challenge is to make this oversized shirt work on my petite frame. As you can tell from the picture, this shirt is quite big on me. There is so much room around my waist area. No way I am wearing this shirt in public. The only thing you need to look for when buying oversized shirt is that it needs to fit your shoulders. There is not much we can do to fix that. Overall, this shirt is not flattering on me at all. To make this work, first step is to roll up the sleeves and throw in a belt to define my waist. The shirt looks better instantly! Because I am wearing a baggy shirt on top, I decided to pair this shirt with cropped leggings to balance out the outfit. Leggings also add a feminine touch to the boxy top. To simplify the outfit, I am pairing my outfit with black pumps. Mid-calf leggings look best paired with identical color pumps. Wearing high heels also gives me the appearance of having long, never ending legs. ..And voila! Here is my final look! Lovely outfit for brunch with friends. What do you guys think? Do you think I overcome my challenge or should I file this outfit under "Fashion Police" folder? Wow, great job! I actually do love this look on you, but I think it's because your limbs are so slender. The length of the shirt ends right at high leg, which naturally draws the eye to that area. I don't think someone with stouter trunks would be able to carry this off nearly as well as you have. Definitely a do! You look really great and did really great with this challenge. Your legs look REALLY long here! I think you made it work! Your legs look super long - I think you look at least 5'6" in this photo danggg. What a great conversion of heck no to heck yes! I think you "rock" this outfit. Shorter petite would not look good in this type of outfit. Such a simple but very effective transformation. Well done! A funny post with such thoughtful narration : ) I love how you showed the before, the transformation steps, and the finished products! To echo R.L...so simple and yet very effective. Now I'm getting nervous...you and Curls&Pearls have already posted and I don't even have my photos together yet. Ahhhh lol! I have been wondering if pairing a belt with a long necklace would work. There's something about this combo that I don't feel right. What do you think? I haven't tried myself...just in my head. The shirt is very pretty. Glad you made it work for you :). You look great and this look totally works. I agree with Callandra - I'm "stouter" and leggings don't get along with me - but you pulled it off nicely! you did great on the challenge . good job. ooo...I like this outfit. The before and after comparisons are always helpful. Those BCBG pumps are terrific. nice job! love the b4 an after pictures. loosey tops are my faves with skinnies. it's a definite do! You definitely look very long and lean in the outfit (even in the before pic, your legs look super long!) I think those extra inches really help even though we have similar measurements. Thanks everyone! I do think I overcame my challenge. Whewww! Fantastic!!! Definitely stealing this idea! Besides capri leggings, what else do you think will work with this top belted? I have one just like that from GAP, gee, i'm not sure what to do with it. And I don't own a capri legging. I think the look is nice, you can go anywhere on the weekend with that look. Casual and chic! Love it! I'm jealous of your skinny little legs >_< If I had legs like that I would run around in shorts and tunic dresses all the time! the outfit looks chic! the leggings look great on you too! I haven't had the guts to wear an oversized shirt paired with leggings yet. For some reason, I'm still scared that it will show a way too detailed view of my bum, LOL! However, this outfit makes you look so tall and plus you wore a long cami underneath...I'm going to give this look a try! Just found your blog, and I love it! You and I are about the same height and weight. I think you pulled off the baggy shirt look very nicely. I agree that mid calf leggings look best on us petite gals, I have two black pairs that I've been wearing all summer.. they go with everything! You look gorgeous!!! I love the belt and leggings on you! You really made that shirt look fantastic on you!! !